- This is a mini-game you can play regardless of your hunting. - You can enjoy the event while hunting with MU Helper. - Rewards will be given according to the acquired score. ① Collect 'Card Piece' item through hunting. ② You can auto-acquire the Card Piece item by checking the 'Event Item' in MU Helper Settings. ③ You can check the item in the Event Inventory. ④ Once you have collected 24 card pieces, a deck will be created and you will be able to play the game. 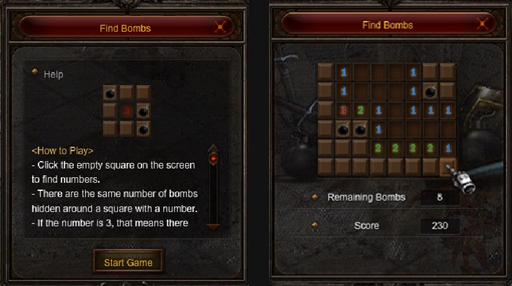 ① Click the 'Find Bombs' banner to play the game. ② If you have a Card Deck, you can click 'Star Game' button to play. ① You can find numbers by clicking the empty space on the screen. A. You will not step on a bomb at your first attempt. ② There are the same number of bombs hidden among 8 squares near an open number. 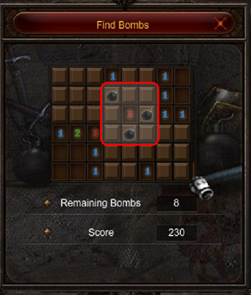 ③ If the number is 3, that means there are three bombs around the neighboring 8 squares. ④ Right click to put a Bomb Card on a square if you think there is a bomb. ⑤ You can cancel the bomb card placement with another mouse right click. ① When you step on a bomb, the game will end. ② You can also end the game if you have used all your Bomb Cards and there is no empty square left. The score is 0 if the final score is a negative number. ① Different scores will be given depending on how many numbers have been open. ② There will be score deductions for wrong Bomb Card placement, or if you have stepped on a bomb. ③ There will be bonus score for clearing the game. ① You can get reward by 'Get Reward' button at the final score window. ② There will be reward starting from 0 point. ③ Different box will be given according to the acquired points. ④ You can check the reward box at Gremory Case (K). A. The reward will be given for characters. ⑤ Gremory Case is valid for 1 day.